This chapter describes how you can install a new Enterprise Manager system while utilizing an existing, certified Oracle Database to store Oracle Management Repository (Management Repository). This chapter is only for installing a complete Enterprise Manager system (with a Management Repository). If you want to install an additional Oracle Management Service (OMS), then see Adding Additional Oracle Management Services. Do not install Enterprise Manager Cloud Control 13c on servers of SPARC series: T1000, T2000, T5xx0, and T3-*. For more information, see My Oracle Support note 1590556.1. For information on the releases Enterprise Manager Cloud Control has had so far, see Procuring the Software in the Oracle Enterprise Manager Cloud Control Advanced Installation and Configuration Guide . You can install Enterprise Manager Cloud Control with either simple or advanced configuration. Table 5-1 describes the basic differences between the two installation types. If you want to install only the software binaries of Enterprise Manager Cloud Control along with Plugins at one point in graphical mode and configure the installation at a later point, you may do so, using the Advanced installation type. For more information on this, see Installing an Enterprise Manager System Using Software Only Install Along With Plugins and Configuring Later in the Enterprise Manager Cloud Control Advanced Installation and Configuration Guide . Meant for small, medium, and large deployments, and when you want to customize your installation with custom locations, directory names, and passwords. Installs with minimal, default configuration settings and preferences that you need for a complete Enterprise Manager system. Does not offer too many options to customize your installation. Offers custom or advanced configuration options that you can select to suit your environment and customize your installation. Configures with less memory to monitor up to 30 targets, with 2 Oracle Management Agents (Management Agent) and 2 concurrent user sessions for handling about 10 jobs per day. Offers an option to select the deployment size (small, medium, or large) of your choice, and depending on the deployment size you select, configures with the required memory. For more information on deployment sizes, the prerequisite checks that are run, the database parameters that are set, and how you can modify the deployment size after installation, see What is a Deployment Size for Enterprise Manager Cloud Control in an Advanced Configuration? in the Oracle Enterprise Manager Cloud Control Advanced Installation and Configuration Guide. Sets lower values for database parameters. For information about the database initialization parameters to be set for various deployment sizes, refer to Software Configurations in the Oracle Enterprise Manager Cloud Control Advanced Installation and Configuration Guide. Sets higher values for database parameters. For information about the database parameters set for different deployment sizes, see Sizing Your Enterprise Manager Deployment in the Oracle Enterprise Manager Cloud Control Advanced Installation and Configuration Guide. Allows you to use a database where the Management Repository is preconfigured using the database templates offered by Oracle. Installs mandatory plug-ins such as Oracle Database plug-in, Oracle Fusion Middleware plug-in, Oracle Exadata plug-in, Oracle Cloud Framework plug-in, and Oracle System Infrastructure plug-in. Installs any other plug-in you select in the installation wizard. Creates a default user account weblogic for the WebLogic domain GCDomain. Allows you to change the name of the default user account weblogic for the WebLogic domain GCDomain. Prompts for a common password for WebLogic Server administration, Node Manager, SYSMAN user account, and Management Agent registration. Prompts for separate, distinct passwords for WebLogic Server administration, Node Manager, SYSMAN user account, and Management Agent registration. Creates a default OMS instance base directory (gc_inst) outside the Middleware home. Allows you to change the name of the default OMS instance base directory (gc_inst) to a name of your choice, and creates that directory outside the Middleware home. Creates tablespaces for management, configuration data, and JVM diagnostics data in default locations. Allows you to change the locations of the tablespaces for management, configuration data, and JVM diagnostics data. Allows you to customize the ports according to your environment. Has only a few interview screens to fill in the Enterprise Manager Cloud Control Installation Wizard. Installs Oracle WebLogic Server 12c Release 1 (12.1.3.0). Installs Java Development Kit (JDK) 1.7.0_80. 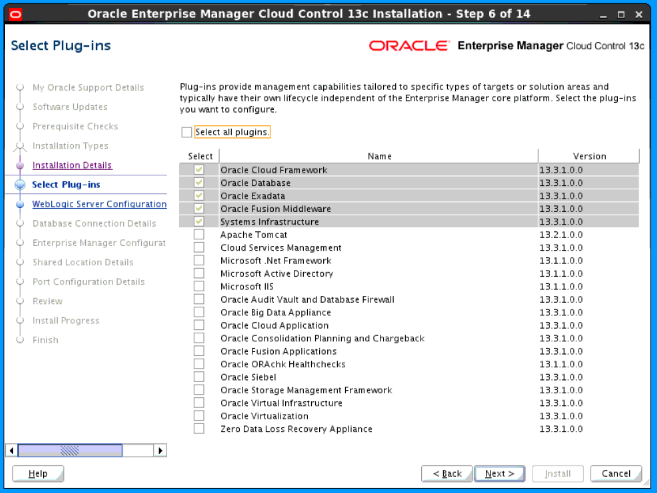 Installs Oracle Management Service 13c Release 2. Installs Oracle Management Agent 13c Release 2 in the agent base directory you specify (outside the middleware home). Installs Oracle JRF 12c Release 1 (12.1.3.0), which includes the oracle_common directory. Installs Oracle Web Tier 12c Release 1 (12.1.3.0). Installs Oracle BI Publisher 12c Release 1 (12.1.3.0), which includes the bi directory. Creates a plug-in directory and installs the following default plug-ins. Starting with 13c Release 1, as part of the Oracle Fusion Middleware Plug-in deployment, one Java Virtual Machine Diagnostics (JVMD) Engine is installed by default on the OMS. For every additional OMS you deploy, you receive one JVMD Engine by default with that OMS. JVMD enables administrators to diagnose performance problems in Java applications in the production environment. By eliminating the need to reproduce problems, it reduces the time required to resolve these problems, thus improving application availability and performance. While JVMD Engine is installed by default on the OMS host, you will still need JVMD Agents to be manually deployed on the targeted JVMs. For instructions to deploy the JVMD Agent, see Installing JVM Diagnostic Agents. Creates an Oracle WebLogic domain called GCDomain. For this WebLogic Domain, a default user account, weblogic, is used as the administrative user. In advanced installation, you can choose to change this if you want. Creates a Node Manager user account called nodemanager. A Node Manager enables you to start, shut down, or restart an Oracle WebLogic Server instance remotely, and is recommended for applications with high availability requirements. Configures an Oracle Management Service Instance Base location (gc_inst) outside the Oracle Middleware home (Middleware home), for storing all configuration details related to the OMS. In advanced installation, you can choose to change this location if you want. For example, if the Middleware home is /u01/software/em13c/oraclehome, then the instance base location is /u01/software/em13c/gc_inst. You can choose to change this, if you want, in the installer. However, you can change it for only advanced installation and not for simple installation. Configures Oracle Management Repository in the existing, certified Oracle Database. If the database instance is created using the database template offered by Oracle, then this step is skipped. The existing, certified Oracle Database must be one of the certified databases listed in the Enterprise Manager certification matrix available on My Oracle Support, or a database instance created with a preconfigured Oracle Management Repository (Management Repository) using the database templates offered by Oracle. To access the Enterprise Manager certification matrix, follow the steps outlined in Accessing the Enterprise Manager Certification Matrix. For information about creating a database instance with a preconfigured Management Repository using the database templates offered by Oracle, refer to Creating a Database Instance with Preconfigured Repository Using Database Templates. The database can be on a local or remote host, and if it is on a remote host, it must be monitored by Oracle Management Agent. However, Oracle Real Application Clusters (Oracle RAC) databases must only be on a shared disk. If you use a database instance that was created with a preconfigured Management Repository using the database templates offered by Oracle, then MDS Schema Configuration is not run. Figure 5-1 shows the contents of the Middleware home for this type of installation. The OMS instance base directory (typically, gc_inst) is maintained outside the middleware home directory, and that is why it is not shown in Figure 5-1. The following are the contents of the agent base directory for the central agent (Management Agent installed with the OMS). Figure 5-2 shows the contents of the agent home that is within the agent base directory. You must ensure that you have the latest Enterprise Manager Cloud Control software. For information about downloading the latest software, see Procuring the Software in the Oracle Enterprise Manager Cloud Control Advanced Installation and Configuration Guide. Ensure that there are no white spaces in the name of the directory where you download and run the Enterprise Manager Cloud Control software from. For example, do not download and run the software from a directory titled EM Software because there is a white space between the two words of the directory name. You can install Enterprise Manager Cloud Control using the installation wizard only on a single host, that is, locally on the server where the wizard is invoked. You cannot install on multiple or remote hosts. Oracle Management Service 13c can communicate only with the following versions of Management Agents. Do not install on a symlink. Installing in such a location may impact life cycle operations such as patching and scaling out. Also, it will impact the functioning of your additional OMS. (Only for Graphical Mode) You must set the DISPLAY environment variable. The Enterprise Manager Cloud Control Installation Wizard installs Java Development Kit (JDK) 1.7.0_80 and Oracle WebLogic Server 12c Release 1 (12.1.3.0) by default. A preinstalled JDK or Oracle WebLogic Server is not supported from 13c Release 1 onwards. You must ensure that the Oracle WebLogic Server 12c Release 1 (12.1.3.0) installed by the Enterprise Manager Cloud Control Installation Wizard is dedicated for Enterprise Manager Cloud Control. You must not have any other Oracle Fusion Middleware product installed in that Middleware home. Enterprise Manager Cloud Control cannot coexist with any Oracle Fusion Middleware product in the same Middleware home because the ORACLE_COMMON property is used by both the products. As a prerequisite, you must have an existing Oracle Database to configure the Management Repository. If you install the OMS and the Oracle Database, which houses the Management Repository, on the same host, then when you reboot the host, the OMS and the Management Agent installed with it will not automatically start up. You will have to manually start them. You can optionally use the database templates offered by Oracle to create a database instance with a preconfigured Management Repository. To do so, refer to Creating a Database Instance with Preconfigured Repository Using Database Templates. You can use such a database instance for simple as well as advanced installation. However, note that the database templates are essentially designed for simple installation, although they can be used for advanced installation. Therefore, while performing an advanced installation (possibly with small, medium, or large deployment size selection), when you provide the details of such a database, you will be prompted that the database parameters need to be modified to suit the deployment size you selected. You can confirm the message to proceed further. The installation wizard will automatically set the database parameters to the required values. If you want to optionally follow the configuration guidelines for deploying the Management Repository so that your management data is secure, reliable, and always available, refer to the Oracle Enterprise Manager Cloud Control Administrator's Guide. Enterprise Manager is not affected when you enable or disable features such as XML DB on the Oracle Database in which you plan to configure the Management Repository. Therefore, you can enable or disable any feature in the database because Enterprise Manager does not rely on them. In addition to the mandatory plug-ins, you can optionally install other plug-ins available in the software kit (DVD, downloaded software). The installer offers a screen where you can select the optional plug-ins and install them. However, if you want to install some plug-ins that are not available in the software kit (DVD, downloaded software), then refer to Advanced Installer Options Supported for Installing an Enterprise Manager System for a Production Site (Advanced Installation). If you are installing on an NFS-mounted drive and creating the OMS instance base directory (gc_inst) on that NFS-mounted drive, then after you install, move the lock files from the NFS-mounted drive to a local file system location. Modify the lock file location in the httpd.conf file to map to a location on a local file system. For instructions, refer to Performing Postinstallation Tasks After Installing an Enterprise Manager System. Once you have reviewed the information in the aforementioned chapters, follow the best practices referenced in Best Practices for Configuring the Cloud Control OMS to be Compatible with Disaster Recovery using Alias Host Names and Storage Replication, in order to best prepare your installation for high availability or disaster recovery. When determining supportability and certification combinations for an Enterprise Manager Cloud Control installation, you must consider Enterprise Manager Cloud Control's framework components as well as the targets monitored by Enterprise Manager Cloud Control. Oracle recommends keeping your Cloud Control components and targets updated to the latest certified versions in order to receive code fixes without having to purchase an Extended Support license. You can find the OMS and Management Agent entries in the /etc/oragchomelist file for all UNIX platforms except HPUNIX, HPia64, Solaris Sparc. On HPia64, Solaris Sparc platforms, the entries are present in /var/opt/oracle/oragchomelist. The locale-specific data is stored in the <OMS_Oracle_Home>/nls/data directory. Oracle strongly recommends that you either set the environment variable ORA_NLS10 to <OMS_Oracle_Home>/nls/data or do not set at all. Enforcing option is supported for Security-Enhanced Linux (SELinux). Do not discover any Oracle ZFS Storage Appliance target in 13c environment. Table 5-3 lists the prerequisites you must meet before installing Enterprise Manager Cloud Control. Ensure that you meet the hard disk space and physical memory requirements as described in Hardware Requirements for Enterprise Manager Cloud Control. Ensure that you install Enterprise Manager Cloud Control only on certified operating systems as mentioned in the Enterprise Manager certification matrix available on My Oracle Support. To access the Enterprise Manager certification matrix, follow the steps outlined in Accessing the Enterprise Manager Certification Matrix. For information about platforms receiving future support, refer to My Oracle Support note 793512.1. OMS on Solaris 11 local zone is not supported. You should see the output similar to the following. Here, s10c_u10wos indicates that update 10 is already installed. If you are installing or upgrading the Enterprise Manager Cloud Control on AIX or HPUX, you need to have an executable bin/bash file. Ensure that you install all the operating system-specific packages, kernel parameters, and libraries as described in Package, Kernel Parameter, and Library Requirements for Enterprise Manager Cloud Control. Ensure that you create the required operating system groups and users as described in Creating Operating System Groups and Users for Enterprise Manager Cloud Control. Ensure that you use a certified browser as mentioned in the Enterprise Manager certification matrix available on My Oracle Support. To access the Enterprise Manager certification matrix, follow the steps outlined in Accessing the Enterprise Manager Certification Matrix. Ensure that the existing database is a certified database as mentioned in the Enterprise Manager certification matrix available on My Oracle Support. To access the Enterprise Manager certification matrix and identify whether your database is a certified database, follow these steps in Accessing the Enterprise Manager Certification Matrix. Alternatively, the database can be a database instance created with a preconfigured Management Repository using the database templates offered by Oracle. For information about creating a database instance with a preconfigured Management Repository using the database templates offered by Oracle, refer to Creating a Database Instance with Preconfigured Repository Using Database Templates. Ensure that this database is dedicated to Enterprise Manager. The database configuration types that are supported are pluggable database (PDB), lone-pluggable database (Lone-PDB), and non-container database (Non-CDB). Ensure that root squash is enabled with execute permission on that host where you want to perform the installation. Ensure that the Access Control List processing is disabled for the NFS mount point. In other words, the mount point must be defined with the noacl option in the /etc/fstab file. Otherwise, the installation can fail. To verify this, run the following command as the install user to check the contents of the /etc/fstab file. Verify if the mount point on which you plan to install Enterprise Manager has the noacl option set. For example, in the following output, the mount point /u01/app/share1 has the noacl option set. In this case, you are ready to proceed with the installation. If you do not have the noacl option set, then contact your System Administrator to make the required changes in the /etc/fstab file. If you are installing on an NFS-shared middleware location, and if that location is mounted with the option concurrent I/O (CIO), which allows multiple reads and writes to a file at the same time, then the installation will fail reporting linking errors. If you verify the mounted file system, you will see the following CIO option enabled. If you have the CIO option enabled, then unmount the drive, disable the CIO option, and then re-mount the drive. Ensure that the number of characters in the middleware home path does not exceed 70 characters for Unix platforms and 25 characters for Microsoft Windows platforms. For example, the middleware home path C:\Oracle\MW\EM containing only 15 characters is acceptable. However, C:\OracleSoftware\OracleMiddleware\OracleEnterpriseManager\OMS\newrelease\oms containing more than 25 characters is not acceptable on Microsoft Windows platforms. (Only for Microsoft Windows) Ensure that the number of characters in the agent base directory path does not exceed 25 characters. For example, the agent base directory path C:\Oracle\Agent\ containing only 16 characters is acceptable. However, C:\Oracle\ManagementAgent\12c\new containing more than 25 characters is not acceptable. Ensure that you check the network configuration to verify that the host on which you are installing resolves to a unique host name and a static IP address that are visible to other hosts in the network. Oracle recommends that you use static IP address. If you use dynamic IP address, and if the host is rebooted, then the host might receive a new IP, and as a result, the OMS startup will fail. Ensure that you allocate 10 GB of hard disk space for the temporary directory. For a typical HA environment with primary and standby disaster recovery sites using storage replication and alias host names, the Central Inventory (oraInventory) for software installed on the shared storage using the alias host name should be located in a shared location that is common between the OMS host in the primary site and the OMS host in the standby site. This shared location should be located on the replicated storage so that the oraInventory can be accessed from the active site for software maintenance activities. Ensure that you unset the CLASSPATH environment variable. You can always reset the variable to the original value after the installation is complete. Ensure that the max user processes parameter and the open files parameter are set to 30000. Ensure that you set the file descriptor limit to a minimum of 65536. Ensure that the ip_local_port_range parameter is set between 11000 to 65000. Ensure that the host name specified in the /etc/hosts file is unique, and ensure that it maps to the correct host name or IP address of that host. Otherwise, the installation can fail on the product-specific prerequisite check page. In some platforms, the installer does not validate the host name mentioned in the /etc/hosts file, therefore make sure the host names or IP addresses are correct. Ensure that localhost is pingable and resolves to 127.0.0.1 (or resolves to ::1 for IPv6 hosts). According to RFC 952, the following are the assumptions: A name (Net, Host, Gateway, or Domain name) is a text string up to 24 characters drawn from the alphabet (A-Z), digits (0-9), minus sign (-), and period (.). Note that periods are only allowed when they serve to delimit components of domain style names. No blank or space characters are permitted as part of a name. No distinction is made between upper and lower case. The first character must be an alpha character. Also, if DNS server is configured in your environment, then you should be able to use DNS to resolve the name of the host on which you want to install the OMS. If alias host names are implemented in /etc/hosts, then it is not necessary to be able to use DNS to resolve the alias host name on which you want to install the OMS. (For UNIX only) The installation must NOT be run by a root user. (For Microsoft Windows only) User must be part of the ORA-DBA group and have administrator permissions. (For Microsoft Windows only) User must belong to the DBA group, and have permissions to perform the following: Act as part of the operating system, Create a token object, Log on as a batch job, and Adjust memory quotas for a process. To verify whether the install user has these rights, from the Start menu, click Settings and then select Control Panel. From the Control Panel window, select Administrative Tools, and from the Administrative Tools window, select Local Security Policy. In the Local Security Settings window, from the tree structure, expand Local Policies, and then expand User Rights Assignment. Ensure that you have write permission in the Middleware home and the Oracle Management Service Instance Base location. Ensure that you have write permission in the temporary directory where the executables will be copied. For example, /tmp or c:\Temp. Ensure that you have write permission in the location where you want to create the Central Inventory (oraInventory) if it does not already exist. If the Central Inventory already exists, then ensure that you have write permission in the inventory directory. Ensure that the user who installed the existing Oracle Database has write permission in the data file locations where the data files for the new tablespaces will be copied. These tablespaces and data files are created while configuring Enterprise Manager Cloud Control. While installing with simple configuration (Installing an Enterprise Manager System for a Demonstration Site (Simple Configuration)), the installer automatically honors the default locations so you are not prompted for them. However, while installing with custom configuration (Installing an Enterprise Manager System for a Production Site (Advanced Configuration)), the installer prompts you to validate or enter the locations explicitly. Ensure that the host on which the OMS is being installed and the host on which the Management Repository is being configured are located in close proximity to each other. Ideally, the round trip network latency between the two should be less than 1 millisecond. Ensure that the ports you assign (within the given range) to the core components of Enterprise Manager Cloud Control are free and available. For information on the core components and their port ranges, see What Ports Are Used for Installation? in the Oracle Enterprise Manager Cloud Control Advanced Installation and Configuration Guide. Using the Internet connection, you can also search and download software updates from My Oracle Support using the installer. For installations that do not have access to the Internet, see What Are the Enterprise Manager Cloud Control Software Updates? in the Oracle Enterprise Manager Cloud Control Advanced Installation and Configuration Guide. These updates should be obtained before starting the 13c installation so they can be available to the installer at the proper time. To install Enterprise Manager Cloud Control for evaluation or demonstration purposes, use the Simple installation type. This installation type installs with default configuration settings and preferences that you need for a complete Enterprise Manager system. It does not offer too many options to customize your installation. For example, only the default plug-ins are deployed with the installation, and you are not provided with a separate screen to manually select the other plug-ins you want to deploy. Therefore, this installation type is primarily meant for demonstration or evaluation purposes, and small deployments, and when you do not want to worry about the granular control of the installer and want to install the Enterprise Manager system quickly, with less memory, and for monitoring fewer targets in their environment. Oracle recommends you to run the EM Prerequisite Kit before invoking the installer to ensure that you meet all the repository requirements beforehand. Even if you do not run it manually, the installer anyway runs it in the background while installing the product. However, running it manually beforehand sets up your Management Repository even before you can start the installation or upgrade process. For information on the kit, to understand how to run it, and to know about the prerequisite checks it runs, see Overview of the EM Prerequisite Kit. However, if you plan to use a database instance that was created with a preconfigured Management Repository using the database templates offered by Oracle, then make sure you pass the following parameter while invoking the EM Prerequisite Kit. Invoke the Enterprise Manager Cloud Control Installation Wizard. Invoke the installation wizard as a user who belongs to the oinstall group you created following the instructions in Creating Operating System Groups and Users for Enterprise Manager Cloud Control. To invoke the installation wizard on UNIX platforms, run em13200_<platform>.bin. To invoke on Microsoft Windows platforms, run setup_em13200_win64.exe. The installer requires about 10 GB of hard disk space in the temporary directory. If your temporary directory does not have this space, then pass the -J-Djava.io.tmpdir parameter and provide an alternative directory where there is 10 GB of space. The directory specified by this parameter will also be used as the location for the Provisioning Advisor Framework (PAF) staging directory, which is used for copying the Software Library entities related to the deployment procedures. The PAF staging directory is used only for provisioning activities — entities are copied for a deployment procedure, and then, deleted once the deployment procedure ends. (Optional) Enter My Oracle Support Details. (Optional) On the My Oracle Support Details screen, enter your My Oracle Support credentials to enable Oracle Configuration Manager. If you do not want to enable Oracle Configuration Manager now, go to Step (3). Local Directory, if you do not have Internet connectivity on your host, and want to download the updates in offline mode and apply them while performing the installation. My Oracle Support, if you have Internet connectivity on your host, and want to connect to My Oracle Support directly via the installer to download the updates in online mode and apply them while performing the installation. For more information on these options, and for instructions to download and apply the software updates using these options, see Are the Software Updates Applied Automatically Even for Databases That Have Oracle Management Repository Preconfigured? in the Oracle Enterprise Manager Cloud Control Advanced Installation and Configuration Guide. The Software Updates screen uses the built-in feature Auto Update to automatically download and deploy the latest recommended patches while installing or upgrading Enterprise Manager Cloud Control. This way, you do not have to keep a manual check on the patches released by Oracle. All patches required by the installer for successful installation and upgrade are automatically detected and downloaded from My Oracle Support, and applied during the installation or upgrade, thus reducing the known issues and potential failures. Oracle strongly recommends using this feature, and applying the software updates while the installation is in progress. For more information, see What Is a Software Update? in the Oracle Enterprise Manager Cloud Control Advanced Installation and Configuration Guide. During installation, you will be prompted for the details of a database where Oracle Management Repository can be configured. If you plan to provide the details of a database that already has an Oracle Management Repository preconfigured using the database templates offered by Oracle, then the software updates selected on this screen cannot be automatically applied. In such a case, you must manually download and apply these software updates after the installation. To invoke the installer on Microsoft Windows, run setup_em13200_win64.exe SHOW_PROXY=true. If Enterprise Manager Cloud Control is the first Oracle product you are installing on the host that is running on UNIX operating system, then the Oracle Inventory screen appears. For details, see step (6). Otherwise, the Check Prerequisites screen appears. For details, see step (8). On the Oracle Inventory screen, do the following. You will see this screen only if this turns out to be your first ever installation of an Oracle product on the host. Enter the full path to a directory where the inventory files and directories can be placed. If this is the first Oracle product on the host, then the default central inventory location is <home directory>/oraInventory. However, if you already have some Oracle products on the host, then the central inventory location can be found in the oraInst.loc file. The oraInst.loc file is located in the /etc directory for Linux and AIX, and in the /var/opt/oracle directory for Solaris, HP-UX, and Tru64. Ensure that you have read, write, and execute permissions on the default inventory directory. If you do not have the required permissions, then exit the installer, invoke the installer again with the INVENTORY_LOCATION parameter, and pass the absolute path to the alternative inventory location. Alternatively, invoke the installer with the -invPtrLoc parameter, and pass the absolute path to the oraInst.loc file that contains the alternative inventory location. However, note that these parameters are supported only on UNIX platforms, and not on Microsoft Windows platforms. Select the appropriate operating system group name that will own the Oracle inventory directories. The group that you select must have write permissions on the Oracle Inventory directories. On the Prerequisite Checks screen, check the status of the prerequisite checks run by the installation wizard, and verify whether your environment meets all the minimum requirements for a successful installation. The installation wizard runs the prerequisite checks automatically when you come to this screen. It checks for the required operating system patches, operating system packages, and so on. The status of the prerequisite check can be either Warning, Failed, Succeeded, Not Executed, In Progress, or Pending. If some checks result in Warning or Failed status, then investigate and correct the problems before you proceed with the installation. The screen provides details on why the prerequisites failed and how you can resolve them. After you correct the problems, return to this screen and click Rerun to check the prerequisites again. However, all package requirements must be met or fixed before proceeding any further. Otherwise, the installation might fail. If a prerequisite check fails reporting a missing package, then make sure you install the required package, and click Rerun. The installation wizard validates the package name as well as the version, so make sure you install the packages of the minimum versions mentioned in Package, Kernel Parameter, and Library Requirements for Enterprise Manager Cloud Control. To understand the logic the installation wizard uses to verify these packages, see About the Logic Used by the Enterprise Manager Cloud Control Installation Wizard to Verify the Packages. On the Installation Types screen, select Create a new Enterprise Manager system, then select Simple. Enter the Middleware home where you want to install the OMS and other core components. The Enterprise Manager Cloud Control Installation Wizard installs Oracle WebLogic Server 12c Release 1 (12.1.3.0) and JDK 1.7.0_80 by default in this middleware home directory you enter here. A preinstalled JDK or Oracle WebLogic Server is not supported from 13c Release 1 onwards. By default, the OMS instance base directory (gc_inst) is created outside the middleware home, and at the same parent level as the middleware home. For example, if you enter u01/software/oracle/middleware as the middleware home, then the instance base directory is created as u01/software/oracle/gc_inst. However, if you are installing on an NFS-mounted drive and creating the OMS instance base directory (gc_inst) on that NFS-mounted drive, then after you install, move the lock files from the NFS-mounted drive to a local file system location. Modify the lock file location in the httpd.conf file to map to a location on a local file system. For instructions, refer to Performing Postinstallation Tasks After Installing an Enterprise Manager System. Enter the absolute path to the agent base directory, a location outside the Oracle Middleware home where the Management Agent can be installed. For example, if the middleware home is /u01/software/em13c/oraclehome, then you can specify the agent base directory as /u01/software/em13c/agentbasedir. Ensure that this location is empty and has write permission. Also ensure that it is always maintained outside the middleware home. Validate the name of the host where you want to configure the OMS. The host name appears as a fully qualified name. The host name can also appear as a virtual host name if your host is configured with virtual machine. You can choose to accept the default host name and proceed with the installation. Alternatively, you can change the name if it is incorrect, or enter another host name for this host. Ensure that the host name you enter is accessible from other hosts in the network (other hosts must be able to ping this host). The host name appears as a fully qualified name, or as a virtual host name if your host is configured with virtual machine. If the installation wizard was invoked with a value for ORACLE_HOSTNAME, then this field is prepopulated with that name. Accept the default host name, or enter a fully qualified domain name that is registered in the DNS and is accessible from other network hosts, or enter an alias host name that is defined in the /etc/hosts file on all the OMS instances at this site. The host name must resolve to the local host or virtual host because the host name is used for the local Oracle WebLogic Server as well as the Oracle Management Service. Do not provide a remote host or a load balancer virtual host in this field. Do not enter an IP address. Do not use underscores in the name. Short names are allowed, but you will see a warning, so Oracle recommends that you enter a fully qualified domain name instead. Enter an administrator password, which can be used as a common password for configuring the Enterprise Manager Cloud Control. Table 5-4 describes what the administrator password is used for. The user account is used as the super administrator for configuring the SYSMAN schema in the Management Repository. The user account is used as the administrator for creating the default WebLogic domain GCDomain. The user account is automatically created during the configuration of Enterprise Manager Cloud Control. A Node Manager enables you to start, shut down, or restart an Oracle WebLogic Server instance remotely, and is recommended for applications with high availability requirements. The agent registration password is used for authenticating new Management Agents that join Enterprise Manager system, where the communication between the OMS and the Management Agent is secure. Provide details of the existing, certified database where the Management Repository needs to be created. If you have already created a database instance with a preconfigured Management Repository using the database templates offered by Oracle, then provide details about that database instance. The installer uses this information to connect to the existing database for creating the SYSMAN schema and plug-in schemas. If you provide details of a database that already has a preconfigured Management Repository, then the installer only creates plug-in schemas. If you connect to a database instance that was created using the database template offered by Oracle, then the password assigned to user accounts SYSMAN, SYSMAN_MDS, SYSMAN_APM, and SYSMAN_OPSS, which were created while preconfiguring the Management Repository, are automatically reset with the administrator password you enter here on this screen. We also unlock all these user accounts. To identify whether your database is a certified database listed in the certification matrix, follow the steps outlined in Accessing the Enterprise Manager Certification Matrix. If you are providing the details of a pluggable database (PDB), then use the full service name instead of the alias. For example, pdb.example.com. If you are providing the details of a lone-pluggable database (Lone-PDB), then use the full service name. For example, pdb.example.com. If you are providing the details of a non-container database (Non-CDB), then use the SID. If you are providing the details of an Oracle RAC database that is configured with Single Client Access Name (SCAN), then enter the SCAN name as the host name. For information on all the database initialization parameters that are set, and all the prerequisite checks that are run, and for instructions to run the prerequisite checks manually if they fail, see Overview of the EM Prerequisite Kit. If you are connecting to an Oracle RAC database, and if you have specified the virtual IP address of one of its nodes, then the installation wizard prompts you with a Connection String dialog and requests you to update the connection string with information about the other nodes that are part of the cluster. Update the connection string and click OK. If you want to test the connection, click Test Connection. If your Oracle RAC database 11.2 or higher is configured with Single Client Access Name (SCAN) listener, then you can enter a connection string using the SCAN listener. If you are connecting to an Oracle Database that is configured with CDB or PDB, then make sure you open the PDB before you provide the PDB details on this screen. (1) Verify that SYS password provided is valid. (2) Verify that the database initialization parameter REMOTE_LOGIN_PASSWORDFILE is set to Shared or Exclusive. (3) Verify that password file with the file name orapw<SID> exists in the <ORACLE_HOME>/dbs directory of the database home. If it does not, create a password file using the ORAPWD command. When you invoke the installer on Microsoft Windows, the Enterprise Manager Shared Location Details screen does not show the Config Volume and Cluster Volume options. This is an expected behavior. (Optional) Configure Oracle Software Library. Oracle Software Library (Software Library) is a feature within Enterprise Manager Cloud Control that acts as a repository to store software entities such as software patches, virtual appliance images, reference gold images, application software, and their associated directive scripts. You require the Software Library for operations such as provisioning, patching, and so on. Select Configure Oracle Software Library, and enter the absolute path leading up to a unique directory name. By default, the storage location that is configured is the OMS Shared File System location, so Oracle strongly recommends that the location you enter is a mounted location on the OMS host. This helps when you install additional OMS instances that can use the same mounted Software Library location. Software Library supports two types of storage locations, mainly OMS Shared File System location and OMS Agent File System location. To understand these storage locations, see Upload File Locations in the Oracle Enterprise Manager Cloud Control Administrator's Guide. For some reason, if you are unable to configure an OMS Shared File System location, then configure an OMS Agent Storage location. For instructions, see the section on configuring an OMS Agent file system location in Configuring an OMS Agent File system Location in the Oracle Enterprise Manager Cloud Control Administrator's Guide. Configuring the Software Library at the time of installation is optional. Even if you do not select this option and configure it now, your installation will succeed. You always have the option of configuring the Software Library later using the Initial Setup Console or the Software Library Administration Console (available within the Enterprise Manager Cloud Control Console). However, Oracle strongly recommends that you select this option and configure it at the time of installation so that the installer can automatically configure it for you. This saves time and effort, and enables you to install an additional OMS, immediately after the first OMS, and configure it to use the same Software Library location. Once the Software Library is configured, you can view the location details in the Software Library Administration Console. To access this console, from the Setup menu, select Provisioning and Patching, then select Software Library. (Optional) Configure a shared location for Oracle BI Publisher that is installed and configured by default. The shared storage location will act as a common location for storing the report catalog and associated management information for the first OMS you are installing now and also for the additional OMS you plan to install in the future. (i) Identify a shared location that you can use for Oracle BI Publisher. If you do not have an existing shared location, create a new one and ensure that it is visible on the host where you are installing the first OMS and also on other hosts where you plan to install additional OMS instances. At install time, for the installation to be successful, you can reserve approximately 400 MB of hard disk space for the shared directory. However, Oracle recommends that you scale it to at least 10 GB eventually, and ensure that it can be extended further in the future because the space utilization increases over a period of time as you install additional plug-ins and create more reports. If you already have a shared location that you were using for the Software Library or for staging gold images in the previous release of Enterprise Manager, then you can choose to use the same location. However, ensure that the directories within the shared location are unique for Oracle BI Publisher, Software Library, and staged gold images. For example, if you already are using the shared location /u01/software/examplehost/shrd/ where the Software Library is configured in /u01/software/examplehost/shrd/SW, then you can use the same location, but make sure the directory within this shared location for Oracle BI Publisher is /u01/software/examplehost/shrd/BIP. (ii) On this screen, select Configure a Shared Location for Oracle BI Publisher. Enter the following directory paths. Ensure that the user account that you are using to install the first OMS has read and write permission on these paths. For Cluster Volume, enter the path leading up to the /cluster directory on the shared storage location where Oracle BI Publisher scheduler storage can be maintained for Oracle BI Publisher to operate in a high-availability environment. For example, /ntwkshrd/bip/cluster. Do not delete these directories after the installation. The directories are required for proper functioning of Oracle BI Publisher, and therefore are required during the installation and also after the installation. (Optional) Enable or disable the installed and configured Oracle BI Publisher. Enabling Oracle BI Publisher starts the software and keeps it ready for use within the Enterprise Manager system. Disabling Oracle BI Publisher leaves the software as it is without starting it. To enable Oracle BI Publisher, select Enable Oracle BI Publisher. If you choose to disable Oracle BI Publisher during the installation, then you can enable it after the installation by running the following EM CTL command from the bin directory of the Oracle home. The command only enables Oracle BI Publisher, but does not start it. To start it, run the following command from the bin directory of the Oracle home. On the Review screen, review the details you provided for the selected installation type. If you want to change the details, click Back repeatedly until you reach the screen where you want to make the changes. After you verify the details, if you are satisfied, click Install to begin the installation process. On the Install Progress screen, view the overall progress (in percentage) of the installation and the status of each of the configuration assistants. Configuration assistants are run for configuring the installed components of Enterprise Manager Cloud Control. If a configuration assistant fails, the installer stops and none of the subsequent configuration assistants are run. Resolve the issue and retry the configuration assistant. For more information, see Troubleshooting Configuration Data Collection Tools in the Oracle Enterprise Manager Cloud Control Advanced Installation and Configuration Guide. If you accidently exit the installer before clicking Retry, then do NOT restart the installer to reach the same screen; instead, invoke the runConfig.sh script from the Oracle home to rerun the Configuration Assistant in silent mode. For Microsoft Windows platforms, invoke runConfig.bat script. If the runConfig.sh script fails, then clean up your environment and redo the installation. Once the software binaries are copied and configured, you are prompted to run the allroot.sh script, and the oraInstRoot.sh script if this is the first Oracle product installation on the host. Open another window, log in as root, and manually run the scripts. If you are installing on Microsoft Windows operating system, then you will NOT be prompted to run this script. On the Finish screen, you should see information pertaining to the installation of Enterprise Manager. Review the information and click Close to exit the installation wizard. If a Server Load Balancer (SLB) is configured in your environment, and the upload port is locked, then configure the SLB for JVMD Engines, and then secure the OMS. If an SLB is configured in your environment, but the upload port is unlocked, then decide whether you want to route the JVMD traffic through the SLB. If you do, then configure the SLB for JVMD Engines, and then secure the OMS. If the installation fails for some reason, review the log files. For more information, see Overview of the Installation and Configuration Log Files in the Oracle Enterprise Manager Cloud Control Advanced Installation and Configuration Guide. If you have run the installation wizard and let the installation wizard take corrective actions to correct the repository settings, and if you have exited the wizard without completing the installation process, then remember that the repository settings might not reset to their original values because you abruptly ended the installation. In this case, before invoking the installation wizard again, run the EM Prerequisite Kit to manually reset the values. To do so, see Overview of the EM Prerequisite Kit. To install Enterprise Manager Cloud Control in a production environment, use the Advanced installation type. This installation type offers custom or advanced configuration options that enable you to customize your installation to suit your needs. Offers an option to select the deployment size (small, medium, or large) of your choice, and depending on the deployment size you select, configures with the required memory. The deployment size essentially indicates the number of targets you plan to monitor, the number of Management Agents you plan to have, and the number of concurrent user sessions you plan to have. Deploys the mandatory plug-ins such as Oracle Database plug-in, Oracle Fusion Middleware plug-in, Oracle Exadata plug-in, Oracle Cloud Framework plug-in, and Oracle System Infrastructure plug-in. In addition, enables you to select and deploy other optional plug-ins of your choice. For example, for Linux platform, run /u1/software/em/em13300_linux64.bin. To invoke the installation wizard on UNIX platforms, run em13300_<platform>.bin. To invoke on Microsoft Windows platforms, run setup_em13300_win64.exe. If the host from where you are running the installation wizard does not have a connection to the Internet, then enter only the e-mail address and leave the other fields blank. After you complete the installation, manually collect the configuration information and upload it to My Oracle Support. For instructions, see What Are the Enterprise Manager Cloud Control Software Updates? in the Oracle Enterprise Manager Cloud Control Advanced Installation and Configuration Guide. You can choose to ignore the checks with Warning status by clicking Ignore. However, all package requirements must be met or fixed before proceeding any further. On the Installation Types screen, select Create a new Enterprise Manager system, then select Advanced. Enter the Middleware home where you want to install the OMS and other core components. This is essentially the Oracle home. The Enterprise Manager Cloud Control Installation Wizard installs Oracle WebLogic Server 12c Release 1 (12.1.3.0) and JDK 1.7.0_111 by default in this middleware home directory you enter here. A preinstalled JDK or Oracle WebLogic Server is not supported from 13c Release 1 onwards. Enter the absolute path to the agent base directory, a location outside the middleware home where the Management Agent can be installed. For example, if the middleware home is /u01/software/em13c/oraclehome, then you can specify the agent base directory as /u01/software/em13c/agentbasedir. Ensure that this location is empty and has write permission. Also ensure that it is always maintained outside the Oracle Middleware home. On the Plug-In Deployment screen, select the optional plug-ins you want to install from the software kit (DVD, downloaded software) while installing the Enterprise Manager system. Plug-Ins are pluggable entities that offer special management capabilities customized to suit specific target types or solution areas. The pre-selected rows are mandatory plug-ins that will be installed by default. Select the optional ones you want to install. If you select a deprecated plug-in that is supported only in 13c Release 3 but not in any of the future releases, then you are prompted to evaluate your selection and decide whether or not you want to proceed with the deployment of such plug-ins. During installation, if you want to install a plug-in that is not available in the software kit, then refer to Advanced Installer Options Supported for Installing an Enterprise Manager System for a Production Site (Advanced Installation) for the point that describes how you can install additional plug-ins. Enter WebLogic Server Configuration Details. On the WebLogic Server Configuration Details screen, enter the credentials for the WebLogic Server user account and the Node Manager user account, and validate the path to the Oracle Management Service instance base location. Ensure that the Oracle Management Service instance base location is outside the middleware home. By default, the WebLogic user name is weblogic. If you want, you can modify it. Ensure that your password contains at least 8 characters without any spaces, begins with a letter, and includes at least one numeric value. Ensure that the Oracle Management Service instance base location is outside the middleware home. If you are installing on an NFS-mounted drive and creating the OMS instance base directory (gc_inst) on that NFS-mounted drive, then after you install, move the lock files from the NFS-mounted drive to a local file system location. Modify the lock file location in the httpd.conf file to map to a location on a local file system. For instructions, see Performing Postinstallation Tasks After Installing an Enterprise Manager System. By default, the WebLogic Domain name is GCDomain, and the Node Manager name is nodemanager. These are non-editable fields. The installer uses this information for creating Oracle WebLogic Domain and other associated components such as the admin server, the managed server, and the node manager. A Node Manager enables you to start, shut down, or restart an Oracle WebLogic Server instance remotely, and is recommended for applications with high availability requirements. If you connect to a database instance that was created using the database template offered by Oracle, then note that the password assigned to the user accounts SYSMAN_MDS, SYSMAN_APM, and SYSMAN_OPSS, which were created while preconfiguring the Management Repository, are automatically reset with the SYSMAN password you enter on the Enterprise Manager Configuration Details screen (as described in Step (20)). For more information on creating a database instance with Preconfigured Repository using database templates for CDB and PDB, refer Creating a Database Instance with Preconfigured Repository Using Database Templates for CDB and PDB. Select the deployment size from the Deployment Size list to indicate the number of targets you plan to monitor, the number of Management Agents you plan to have, and the number of concurrent user sessions you plan to have. Table 5-5 describes each deployment size. If the database you are connecting to is a database instance created with a preconfigured Management Repository using the database templates offered by Oracle (as described in Creating a Database Instance with Preconfigured Repository Using Database Templates), then make sure the deployment size you select on this screen matches with the deployment size you selected in the Oracle Database Configuration Assistant (DBCA) while creating the database instance. Select the deployment size of your choice on this screen, and click Next. When you see errors, fix the parameters in the database, then return to this screen to continue with the installation. To automatically fix the parameters using Oracle-supplied SQL scripts, see Automatically Setting Database Parameters and Converting the Management Repository to Support a Deployment Size (Large, Medium, or Small). Minimize the installer, create another database instance with a template for the desired deployment size, then return to this screen and select the matching deployment size. For instructions, see Creating a Database Instance with Preconfigured Repository Using Database Templates. Enter Enterprise Manager Configuration Details. For SYSMAN Password, enter a password for creating the SYSMAN user account. The SYSMAN user account is used for creating the SYSMAN schema, which holds most of the relational data used in managing Enterprise Manager Cloud Control. SYSMAN is also the super administrator for Enterprise Manager Cloud Control. If you connect to a database instance that was created using the database template offered by Oracle, then note that the password assigned to the user accounts SYSMAN_MDS, SYSMAN_APM, and SYSMAN_OPSS, which were created while preconfiguring the Management Repository, are automatically reset with the SYSMAN password you enter on this screen. For Registration Password, enter a password for registering the new Management Agents that join the Enterprise Manager system. For Management Tablespace, enter the full path to the location where the data file for management tablespace (mgmt.dbf) can be stored. The installer uses this information for storing data about the monitored targets, their metrics, and so on. Ensure that the specified path leads up to the file name. If the database is on Oracle Automatic Storage Management (Oracle ASM), then the path must look like: +<disk_group>/<sid>/<subdir_path_if_any>/<datafilename>.dbf. For Configuration Data Tablespace, enter the full path to the location where the data file for configuration data tablespace (mgmt_ecm_depot1.dbf) can be stored. This is required for storing configuration information collected from the monitored targets. Ensure that the specified path leads up to the file name. For JVM Diagnostics Data Tablespace, enter the full path to a location where the data file for JVM Diagnostics data tablespace (mgmt_deepdive.dbf) can be stored. Ensure that the specified path leads up to the file name. Enterprise Manager Cloud Control requires this data file to store monitoring data related to JVM Diagnostics and Application Dependency Performance (ADP). Configure Oracle Software Library. Oracle Software Library (Software Library) is a feature within Enterprise Manager Cloud Control that acts as a repository to store software entities such as software patches, virtual appliance images, reference gold images, application software, and their associated directive scripts. You require the Software Library for operations such as provisioning, patching, and so on. by selecting Configure Oracle Software Library. Enter the absolute path leading up to a unique directory name. By default, the storage location that is configured is the OMS Shared File System location, so Oracle strongly recommends that the location you enter is a mounted location on the OMS host. This helps when you install additional OMS instances that can use the same mounted Software Library location. Software Library supports two types of storage locations, mainly OMS Shared File System location and OMS Agent File System location. To understand these storage locations, see Upload File Locationsin the Oracle Enterprise Manager Cloud Control Administrator's Guide. Configure a shared location for Oracle BI Publisher that is installed and configured by default. The shared storage location will act as a common location for storing the report catalog and associated management information for the first OMS you are installing now and also for the additional OMS you plan to install in the future. For Config Volume, enter the path leading up to the /config directory on the shared storage location where Oracle BI Publisher repository and configuration files can be stored. For example, /ntwkshrd/bip/config. Enable or disable the installed and configured Oracle BI Publisher. Enabling Oracle BI Publisher starts the software and keeps it ready for use within the Enterprise Manager system. Disabling Oracle BI Publisher leaves the software as it is without starting it. On the Port Configuration Details screen, customize the ports to be used for various components. If all the ports on this screen appear as -1, then it indicates that the installer is unable to bind the ports on the host. To resolve this issue, exit the installer, verify the host name and the IP configuration of this host (ensure that the IP address of the host is not being used by another host), restart the installer, and try again. You can enter a free custom port that is either within or outside the port range recommended by Oracle. However, the custom port must be greater than 1024 and lesser than 65535. Alternatively, if you already have the ports predefined in a staticports.ini file and if you want to use those ports, then click Import staticports.ini file and select the file. If the staticports.ini file is passed during installation, then by default, the ports defined in the staticports.ini file are displayed. Otherwise, the first available port from the recommended range is displayed. If the installation fails for some reason, review the log files listed in Overview of the Installation and Configuration Log Files in the Oracle Enterprise Manager Cloud Control Advanced Installation and Configuration Guide. By default, GCDomain is the default name used for creating the WebLogic Domain. Custom WebLogic Domain name, is not supported. By default, a Provisioning Advisor Framework (PAF) staging directory is created for copying the Software Library entities related to the deployment procedures. By default, this location is the scratch path location (/tmp). The location is used only for provisioning activities—entities are copied for a deployment procedure, and then, deleted once the deployment procedure ends. If you want to override this location with a custom location, then invoke the installer with the -J-Djava.io.tmpdir option, and enter a unique custom location. This displays a list of plug-ins available in the software kit (DVD, downloaded software) as well as the plug-ins available in this custom location. You can choose the ones you want to install. After the installation ends successfully, the OMS and the Management Agent start automatically. If you do not want them to start automatically, then invoke the installer with START_OMS and START_AGENT options, and set them to true or false depending on what you want to control. To understand the limitations involved with this advanced option, see Limitations with the Advanced Options Supported for Installing an Enterprise Manager System for a Production Site (Advanced Installation). When you use START_OMS and START_AGENT as advanced options to control the way the OMS and the Management Agent start up automatically, sometimes the Management Agent and the host on which it was installed do not appear as targets in the Cloud Control console. If the database you are connecting to is a database instance created with a preconfigured Management Repository using the database templates offered by Oracle (as described in Creating a Database Instance with Preconfigured Repository Using Database Templates), then you should make sure the deployment size you select on the Database Connection Details screen of the installer matches with the deployment size you selected in the Oracle Database Configuration Assistant (DBCA) while creating the database instance. If you want to select a deployment size different from the deployment size you had selected while creating the database instance using DBCA, then you must first fix the parameters in the database, then return to the Database Connection Details screen of the installer to continue with the installation. Log in to SQL Plus as SYSMAN. Depending on the deployment size for which you want to install Enterprise Manager, run one of the following scripts. To download these scripts, follow Step (2) and Step (3) outlined in Creating a Database Instance with Preconfigured Repository Using Database Templates. For information on deployment sizes, the prerequisite checks that are run, the database parameters that are set, and how you can modify the deployment size after installation, see What is a Deployment Size for Enterprise Manager Cloud Control in an Advanced Configuration? in the Oracle Enterprise Manager Cloud Control Advanced Installation and Configuration Guide. Enterprise Manager Cloud Control provides you with a single pane of glass for monitoring and managing both your on-premise and Oracle Cloud deployments, all from the same management console. By deploying Hybrid Cloud Agents onto the Oracle Cloud virtual hosts serving your Oracle Cloud services, you are able to manage Oracle Cloud targets just as you would any other. For more information on Hybrid Cloud Management and for instructions to enable the feature, see Enabling Hybrid Cloud Management in the Oracle Enterprise Manager Cloud Control Administrator's Guide. If this is the first Oracle product you just installed on the host, then run the oraInstroot.sh script from the inventory location specified in the oraInst.loc file that is available in the Management Agent home. Navigate to the Oracle home and run the following command to see a message that confirms that OMS is up and running. Navigate to the Management Agent home and run the following command to see a message that confirms that the Management Agent is up and running. Navigate to the Management Agent home and run the following command to see a message that confirms that EMD upload completed successfully. Verify if all the plug-ins were installed successfully. To do so, access the following log file from the Management Agent home, and make sure the sentence WARN:Plugin configuration has failed is not present in the file. If the sentence is not present, it is an indication that all plug-ins were installed successfully. If you find the sentence, then it is an indication that the plug-in installed failed for some plug-ins. In this case, resolve the issue by running the AgentPluginDeploy.pl script from the Management Agent home. (Optional) If the repository prerequisites had failed, and if you had manually run the EM Prerequisite Kit and taken corrective actions to meet the repository requirements, then run the kit again to reset the repository settings to what it had originally. To do so, run the EM Prerequisite Kit from the Oracle home of the OMS host (that is, the middleware home). If you had run the installation wizard and let the installation wizard take corrective actions to correct the repository settings, and if you had exited the wizard without completing the installation process, then remember that the repository settings might not reset to their original values because you abruptly ended the installation. In this case, before invoking the installation wizard again, run the aforementioned command to manually reset the values. Application deployments, one for the Enterprise Manager Cloud Control console and one for the platform background services. However, the other targets running on that host and other hosts do not get automatically discovered and monitored. To monitor the other targets, you need to add them to Enterprise Manager Cloud Control either using the Auto Discovery Results page, the Add Targets Manually page, or the discovery wizards offered for the targets you want to monitor. For information about discovering targets in Enterprise Manager Cloud Control, see Discovering and Adding Host and Non-Host Targets in the Oracle Enterprise Manager Cloud Control Administrator's Guide. If you installed on an NFS-mounted drive and created the OMS instance base directory (gc_inst) on that NFS-mounted drive, then move the lock files from the NFS-mounted drive to a local file system location. To do so, modify the lock files location in the httpd.conf file to map to a location on a local file system. Oracle recommends you to take a backup of this file before editing it. Search for sections related to the modules mpm_prefork_module and mpm_worker_module. In both these sections, modify the value for the LockFile parameter so that the path leads to a location on the local file system. If the directory does not already exist, then create it first, and then provide the path to that directory. Configure your proxy as described in Configuring Proxies for OMS and Management Agent Communication in the Oracle Enterprise Manager Cloud Control Advanced Installation and Configuration Guide. (Optional) If you want to change the SYSMAN password, then shut down the OMS, run the following command from the Oracle home of the OMS, and then start the OMS. You will be prompted to enter the old and the new password. This command concurrently changes the passwords in both the OMS configuration and the database for these affected user accounts. Therefore, it is sufficient to run this command just once. After running the command, do not connect to SQL Plus and update the new password for the SYSMAN user. The command updates the SYSMAN password in the Management Repository for you. An encryption key is generated to encrypt sensitive data in the Management Repository. If this key is lost, all encrypted data in the Management Repository become unusable. Therefore, back up the Management Service configuration including the emkey, and maintain the backup on another host. Before accessing the Enterprise Manager Cloud Control Console in a browser, install a security certificate from a trusted certification authority on the browser. This it to ensure that the Enterprise Manager Cloud Control Console that you are accessing over HTTPS protocol is recognized as a genuine and secure Web site. For instructions to install a security certificate on your browser and avoid security certificate alerts, see EMCTL Secure Commands in the Oracle Enterprise Manager Cloud Control Administrator's Guide. (Optional) If you had not configured a shared storage location for Oracle BI Publisher while installing the OMS, then configure it now. Create a shared directory on any server, and ensure that it is mounted and made visible on the host where you installed the OMS and also made visible on other hosts where you plan to install additional OMS instances. Ensure that you reserve approximately 400 MB of hard disk space for the shared directory. However, Oracle recommends that you scale it to at least 10 GB eventually, and ensure that it can be extended further in the future because the space utilization increases over a period of time as you install additional plug-ins and create more reports. Configure the shared storage location by running the following command. Provide the path to the shared storage location you just created. Ensure that the shared location you provide is owned by the user account that was used for installing the first OMS. Also ensure that the user account has read and write permission to the shared location. You will be prompted for administrator user account password and SYSMAN account password. The preceding command only enables Oracle BI Publisher, but does not start it. To start it, run the following command from the bin directory of the Oracle home.